Enter a world of complete sensory heaven, where time is left at the door and a new journey begins, step into the temple of touch and aroma, here at Duniye Spa. Duniye Spa’s philosophy follows a natural approach to body and skin care, an ethos infused with ancient beauty therapies. The Thai, Indian and Balinese therapists are professionally trained to deliver healing treatments from the heart. 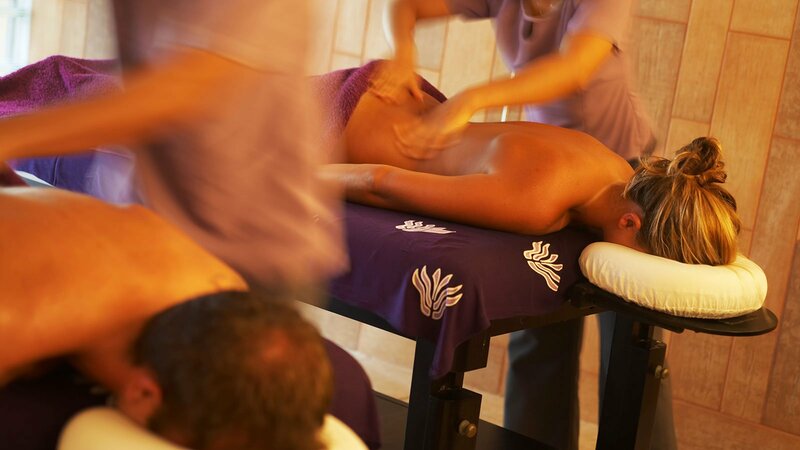 The mixture of signature treatments, massage techniques from around the world, indulgent couple therapies and organic beauty products ensures that there is something for everyone. Romantic Indulgence! Enjoy precious time together immersed in the aromas of pure essential oils while indulging in a restorative and calming Balinese Massage, followed by champagne as you savour this moment. Our bespoke top-to-toe signature ritual uses the essences of 100% pure organic island-grown coconut. Features freshly grounded coconut-vanilla body polish, coconut hair mask and head massage, and a tropical full-body massage with virgin coconut oil. A therapeutic and deeply relaxing massage focusing on the back and upper body area; traditional heated herbs (poultices) are used to facilitate the deep healing process and release muscle tension. Treatments at Duniye Spa can be arranged on arrival at the resort. If you wish to pre-purchase or buy a spa experience for a friend or loved one then Komandoo’s online gift store offers various Duniye Spa Packages. Do we need to pre-book activities? All activities can be booked on arrival at the resort. The spa is open from 08h00 – 22h00, treatments outside of this time can be arranged depending on availability and at a $25 surcharge. Whilst all activities can be arranged onsite, you are welcome to contact us should you wish to make any bookings prior to your stay or have any questions about the spa. Are treatments included in Komandoo’s All Inclusive? Most spa treatments and activities are not part of the all-inclusive packages on Komandoo. However, guests are entitled to join complimentary group yoga sessions that can be organised through the spa. For more information please contact the spa team. Details on all other treatments can be found here. In order to make the most out of your spa experience, we suggest that you shower before any treatment (to remove any excess sunscreen) and arrive 15 minutes before your treatment is due to start. Before your first treatment, our team will ask you a few questions on your medical history and can adapt treatments to help tackle any known issues. For more information on “How to Spa” please see our guide here. Can I do yoga on the island? Yes – we do offer yoga on request, it is offered through Duniye Spa. Group yoga sessions are included in the all-inclusive plan, and private lessons can be arranged on demand.